The Japanese unit of US technology giant Google LLC was told by tax authorities that it failed to declare about ¥3.5 billion (S$44 million) in income by recording revenue through Google's Singaporean unit in the business year ending December 2015, according to sources. 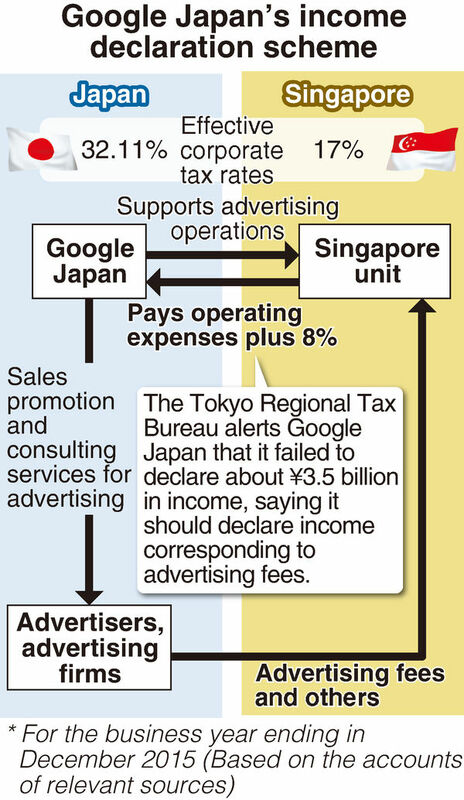 Revenue from Google Japan's advertising business was paid to Google's unit in Singapore, where tax rates are lower. The Japanese unit then received an amount comprising the transferred operating expenses with an 8 per cent bonus from the Singapore unit. The Tokyo Regional Taxation Bureau concluded that profits of the Japanese unit had been kept low by effectively shifting them to Singapore, the sources said. Back taxes for the Japanese unit, based in Minato Ward, Tokyo, are believed to be about ¥1 billion. The company agreed to revise its declared income for the year ending December 2015, and it also voluntarily reported about ¥6 billion in additional corporate income for the 2016 business year, in line with the tax bureau's notification, according to the sources. Internet technology giants - such as Google, Apple Inc., Facebook, Inc. and Amazon.com, Inc., collectively known as GAFA - have faced persistent criticism for shifting profits obtained elsewhere to related companies in countries with lower corporate tax rates. Establishing an appropriate system of taxation has become an international issue. According to the sources, most of Google's revenue has come from advertising since its exponential growth from a service displaying advertisements related to search queries. The Japanese unit conducted sales promotion and consulting services for advertisers and advertising firms in Japan in the form of support for the Singaporean unit. Advertising fees and other payments from advertisers and advertising firms were paid to the Singaporean unit. The Japanese unit then received the equivalent amount with an 8 per cent bonus. The effective corporate tax rate for fiscal 2015 was 32.11 per cent in Japan and 17 per cent in Singapore. The bonus paid to the Japanese unit should be linked to its advertising revenue and other earnings, according to the Tokyo taxation bureau. The tax bureau concluded that Google Japan had transferred part of its income to Singapore, where the income tax rate is lower, through a method in which a fixed rate bonus was used to keep its revenue low, the sources said. Its declared income for the 2015 business year had been about ¥7 billion before the revision. However, after advertising fees and other revenues were incorporated, the declared income totaled about ¥10.5 billion, up about ¥3.5 billion from the initial figure, according to the sources. Similarly, its declared income for the year ending December 2016 amounted to well over ¥10 billion, up about ¥6 billion. A Google Japan official said, "We are unable to confirm facts regarding a failure to declare income or payment of back taxes." The Japanese unit was established in February 2001 as a joint-stock company. It was changed into a limited liability company in November 2016. Google does not make public its sales in the Japanese market.